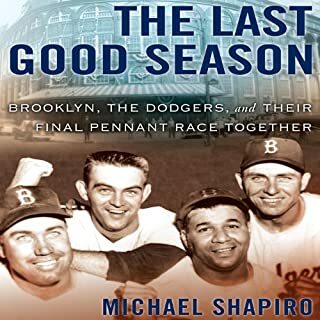 In the best-selling tradition of The Boys of Summer and Wait ‘Til Next Year, The Last Good Season is the poignant and dramatic story of the Brooklyn Dodgers’ last pennant and the forces that led to their heartbreaking departure to Los Angeles. The 1956 Brooklyn Dodgers were one of baseball’s most storied teams, featuring such immortals as Jackie Robinson, Pee Wee Reese, Duke Snider, Gil Hodges, and Roy Campanella. The love between team and borough was equally storied, an iron bond of loyalty forged through years of adversity and sometimes legendary ineptitude. The merit of this retelling of a familiar story is that the author does not overdo any of the angles and aspects from which it is properly considered. He makes it clear enough that this is a book about baseball, so that the details, what's and why's of the move to the west coast is treated as back story, although it is really a more interesting aspect. Same for the headline topic of Jackie Robinson and the transition from his debut to the various ethnicities a fascinating aspect of the roster, including Italian, southern, country boys and more very well and without overly dramatizing any of it. The same can be said for giving equal time, so to speak, to the members of a roster packed with truly great baseball players, many of whose stars faded in baseball lore with the move to the Pacific time zone, all but the Duke really, whose Brooklyn days were when he achieved many of his HOF achievements. But, why the interesting detail on the Braves, with little attention to the Reds? And but, if you will, the official scorer would have to call several errors on plays that really jumped out at me--for example, what writer with even a passing familiarity with sports above the sandlot/playground level would refer to the platooning of 2 players at 2nd base as the manager having them "take turns" at the position? 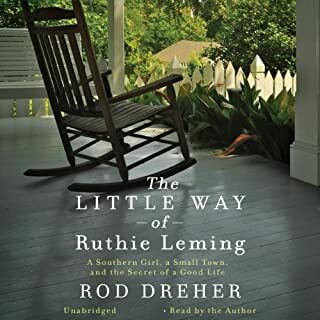 The Little Way of Ruthie Leming follows Rod Dreher, a Philadelphia journalist, back to his hometown of St. Francisville, Louisiana (pop. 1,700) in the wake of his younger sister Ruthie's death. When she was diagnosed at age 40 with a virulent form of cancer in 2010, Dreher was moved by the way the community he had left behind rallied around his dying sister, a schoolteacher. He was also struck by the grace and courage with which his sister dealt with the disease that eventually took her life. 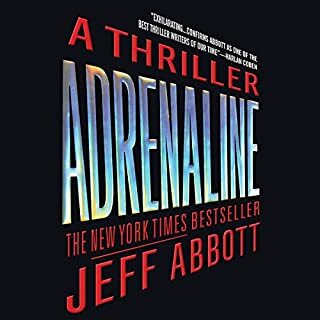 Perhaps as more reviews accumulate (than the small statistical sampling as of my review), the book will settle in with solid 4's across the board as it deserves, though I think that the author's narration is not only a 5, but a reason to listen to the audio over the printed text. I am not reading the lower reviews, apprehensive that I will be tempted to refute them. With even sketchy knowledge of Rod Dreher's professional bio, his transition, even metamorphosis, is impactful enough. His skillful and surprisingly vulnerable translation of the family history and his sister's illness and death into text is a bravura performance. The book is really an achievement, even for an uber-intelligent professional. I return to the narration--if a prospective reader is looking for yet another tiresome performance attempting to translate a book to some kind of audio-only stage play, or another reading with melodrama that makes taking a drink from a water fountain sound more like a baptism with holy water, move on. The low key narration is a wonder, in fact perfect. More, more. Tropper like, but not there yet. Would you try another book from John Kenney and/or Robert Petkoff? Would you recommend Truth in Advertising to your friends? Why or why not? No, but he is good at keeping the narration even, and also accurate when it comes to voices and accents in the dialog, which he does without exaggeration or bombast. Not likely, but it might work as an outline for a weekly tv show. 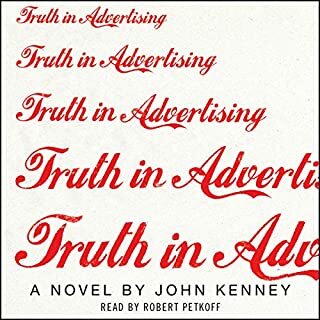 The author is what one of his characters who falls back on cliches and trite descriptions would call "spot on"' when it comes to describing the advertising business and such. His characters are good but the plot is lacking in subtlety or mystery, and the psychological element is dished out in fairly heavy handed fashion. Almost as if he should have lifted the principal plot and built a new one around the settings, characters, and occasionally well crafted vignettes..
You don't have to look very hard at Drew Silver to see that mistakes have been made. His fleeting fame as the drummer for is nearly a decade behind him. He lives in an apartment building filled almost exclusively with divorced men like him, and makes a living playing in wedding bands. And his Princeton-bound teenage daughter, Casey, has just confided in him that she's pregnant - because Silver is the one she cares least about letting down. So when he learns that his heart requires emergency surgery, Silver makes the radical decision to refuse the operation, choosing instead to use what time he has left to repair his relationship with Casey. Different narrator. 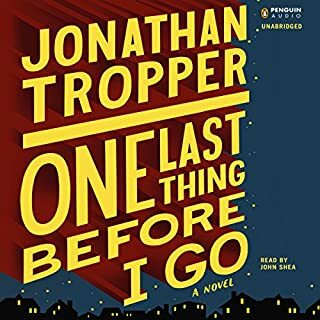 The book is hardly in the class with Tropper's others, but still his skill for describing every day events in a way that these things actually happen makes his stories awfully appealing. Though I've never understood the appeal of listening to 8or more hours of raspy diction, I have dealt with it. Add the wheezy element, though, and i feel as if i might as well be listening to a feeble Burl Ives narrate a B'rer Rabbit tale. I concur with some reviewers that relatively mild tonal variations for various speakers is always a plus, although listening to an 18 year old girl who sounds like Burl Ives is disconcerting. 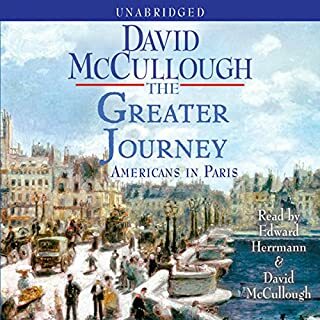 I despair on behalf of all audiobook listeners who just want to have a book read aloud instead of needing, as most of the reviewers of this book apparently do, some sort of stage play performance. Acknowledging that I am in the minority and am going against the grain of the theatrically deprived (and invite un-helpful critiques of this review, thank you folks), I suggest that this very washed up actor is channeling some of his pent up acting frustrations. He pretty much ruins a fair book. 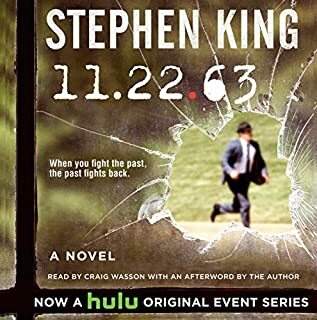 With respect to the novel, there are pages and pages and pages of nothing happening but what's new with King, who has always considered reader boredom an essential piece of his brand of "suspense". Sam Capra is living the life of his dreams. He's a brilliant young CIA agent, stationed in London. His wife Lucy is seven months pregnant with their first child. They have a wonderful home, and are deeply in love. They have everything they could hope for... until they lose it all in one horrifying moment. Here we go again. I guess that there are some audiobook listeners who want their narration to be just short of a dramatic presentation with all but the stage players. Not I. Just read the book narrator. I don't need a Broadway play, just a book. Chill. Hate to "dis" the audio version but you simply have to have the maps, illustrations, maybe even illustrations beyond what the print version offers. Nevertheless, very good. That said, this author writes to illuminate, not to fit readers' expectations. That is commendable. It also produces books that are admirable to say the least but do not in fact always entertain as much as their quality might merit. Good read but be ready to think not just listen. ESPN began as an outrageous gamble with a lineup that included Australian Rules Football, rodeo, and a rinky-dinky clip show called Sports Center. 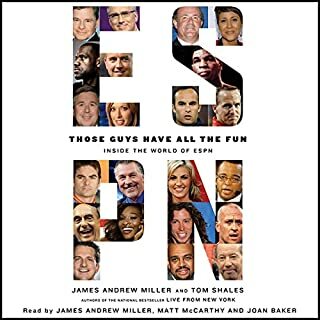 Today the empire stretches far beyond television into radio, magazines, mobile phones, restaurants, video games and more, while ESPN's personalities have become global superstars to rival the sports icons they cover. As "inside stories" go, this is trailing the pack. I suppose it is a nice thing to have all of one's suspicions about the disfunctionality of the world wide leader affirmed with out of context quotes and anecdotes, but this book could have been ten times the "expose" it claims to be. Disappointing. Research scientist Dr. Marina Singh is sent to Brazil to track down her former mentor, Dr. Annick Swenson, who seems to have disappeared in the Amazon while working on an extremely valuable new drug. The last person who was sent to find her died before he could complete his mission. Plagued by trepidation, Marina embarks on an odyssey into the insect-infested jungle in hopes of finding answers to the questions about her friend's death, her company's future, and her own past. Do yourself a favor and listen to this book! It is gratifying to see readers looking for options beyond the typical pop fiction, but enabling this author's goofy notions is an unfortunate result. 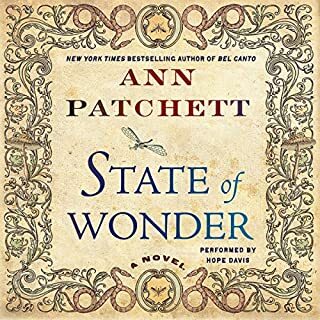 The simplest way to describe this book is that if an unpublished author submitted it to publishers, it would be laughed off the planet, but Ms. Ann's lightning in a bottle success with BC gets it a sell. Joke. Patty and Walter Berglund were the new pioneers of old St. Paul - the gentrifiers, the hands-on parents, the Whole Foods generation. Patty was the ideal sort of neighbor, who could tell you where to recycle your batteries and how to get the local cops to do their job. She was an enviably perfect mother and the wife of Walter's dreams. Together with Walter - environmental lawyer, commuter cyclist, total family man - she was doing her small part to build a better world. Enjoyable book. Really liked the narration. 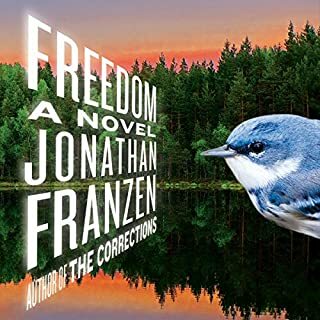 Sorry, I don't get the Franzen thing. I find him occasionally funny, mostly a crashing bore and a self indulgent one at that.